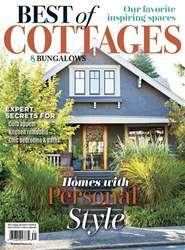 Dress your home in rustic-cottage chic for spring. GATHERING PLACE. The living room showcases the natural elements that the designer likes to add to a space, such as bamboo Roman shades and wicker chairs. “Any room benefits from a piece of wicker”, Ally says. 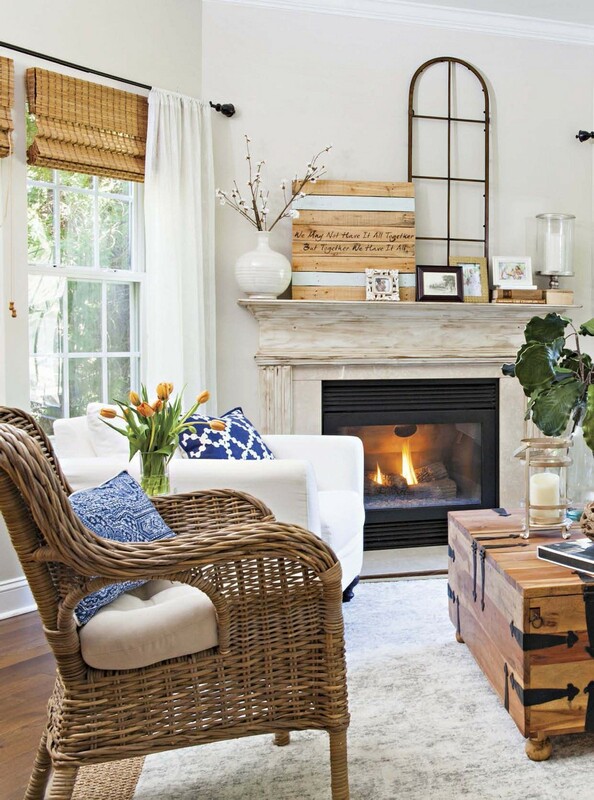 She keeps all her big pieces neutral, then adds a pop of color with pillows and throws to make the room cozy. 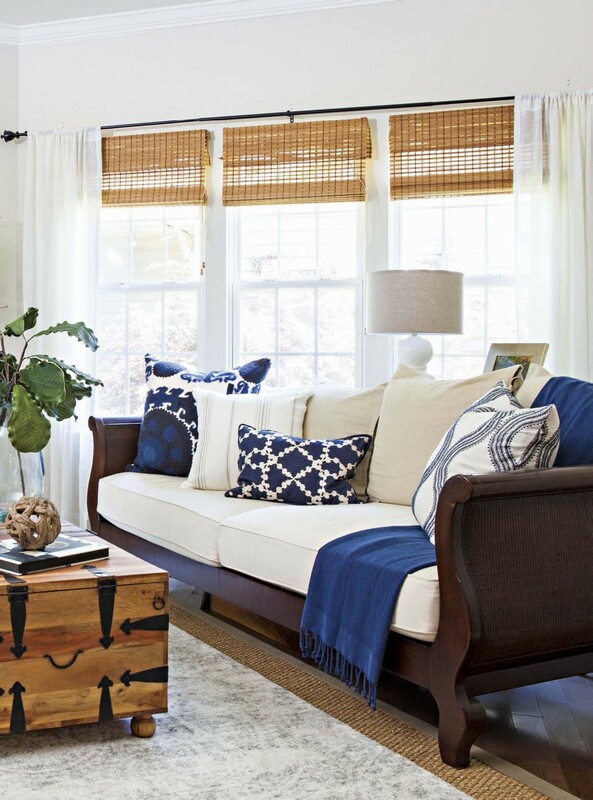 Ally says you should never be afraid to add anything blue to a room—it looks fresh for spring and enhances wood tones. Ally anchored the room with a neutral area rug. 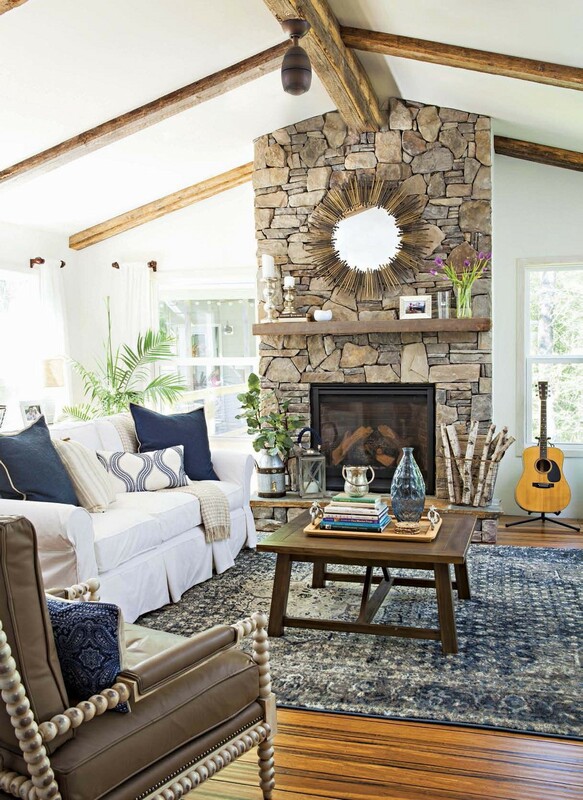 Her tip for rugs is to layer them: Make sure the bottom rug is very thin, and layer a plusher rug on top of it. WARM UP THE FIREPLACE. The family room was an addition to the house. Ally went to a stone yard that had a remnants section, and handpicked each stone to use on the front of the fireplace, mixing and matching them. After they were placed, she layered stain on with a dry rag to warm it up and add more interest. She found the mantel, made of reclaimed wood, at an antiques shop. The spindle-trimmed chair is from Ally’s furniture line. The paint on the walls is the same color as the ceiling, and Ally used a watered-down version around the window trim to let the outside view in and look seamless.